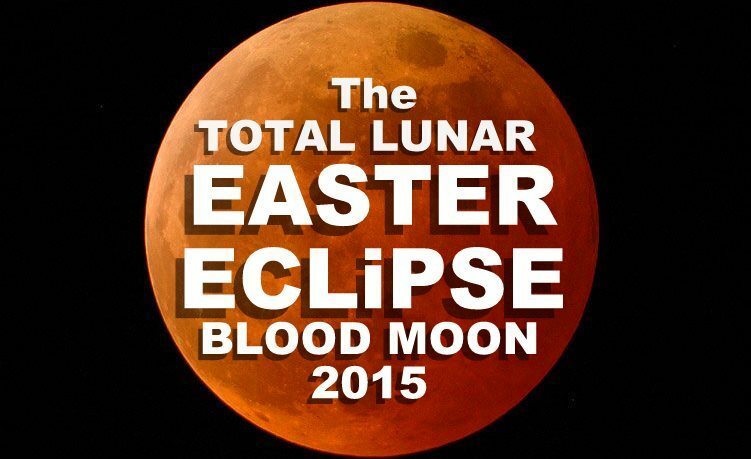 TOTAL LUNAR EASTER ECLiPSE BLOOD MOON 2015 LiVE..
On Easter Saturday the 4th April 2015, sky watchers can see a brief and rare Easter Eclipse of the Moon, visible from most of North America, South America, Asia and Australia. This is the 3rd blood moon eclipse in the 2014 to 2015 tetrad that ends in September. The Moon will be totally eclipsed in totality for about 5 minutes, during the peak of the 3 hours and 29 minutes it takes from start to finish. Red moons have been predicted in the Bible and signify important events. UTC is the primary time standard which the whole world regulates clocks and time. TOTAL LUNAR ECLiPSE / BLOOD MOON : 28th September 2015 | View from Europe, South/East Asia, Africa, most of North America, most of South America, Pacific, Atlantic, Indian Ocean, Arctic & Antarctica.